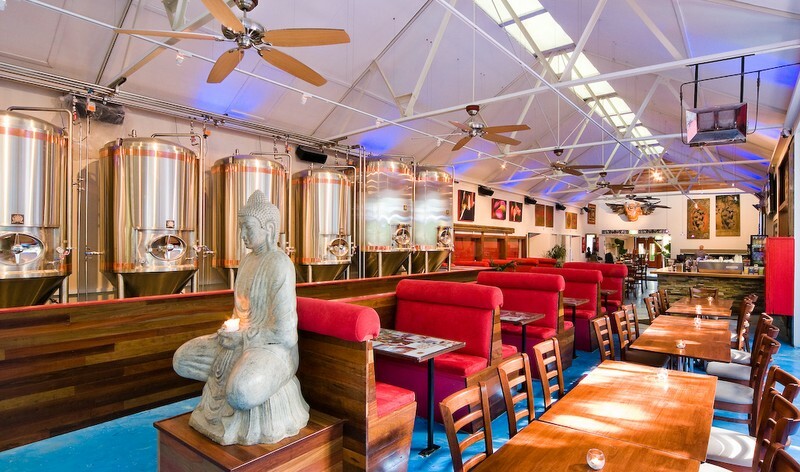 The Byron Bay Brewery & Buddha Bar / Restaurant is the home of Byron Bay Premium Ale and one of Byron's newest attractions. Established in the early 1980's, the Byron Bay Brewery and Buddha Bar / Restaurant enjoys a heritage of an era when rock concerts, hippies and long hair ruled the heart of Byron Bay. After beginning life in 1898 as a piggery, the bar was converted by artists and hippies into a world renowned venue for musicians and was popular with both local and international artists in the 1980's and 1990's. The original home of the East Coast Festival, the Piggery has since become a hit with backpackers who come from everywhere to stay at the Arts Factory Back Packers lodge. The recently refurbished Buddha Bar and Restaurant is now open for business including lunch and dinner. Offering several bar areas, pool tables, a beer garden, premium beer including Byron Bay Premium Ale, food, wine, entertainment and huge plasma screens, the Buddha Bar and Restaurant blends the old with the new at one of Byron Bay's most iconic locations. Open from lunch until late, 7 days a week, the Buddha Bar is an idyllic place for a drink and once the sun sets, is the home of great music and good times. Come along to eat & drink @ The Byron Bay Brewery!